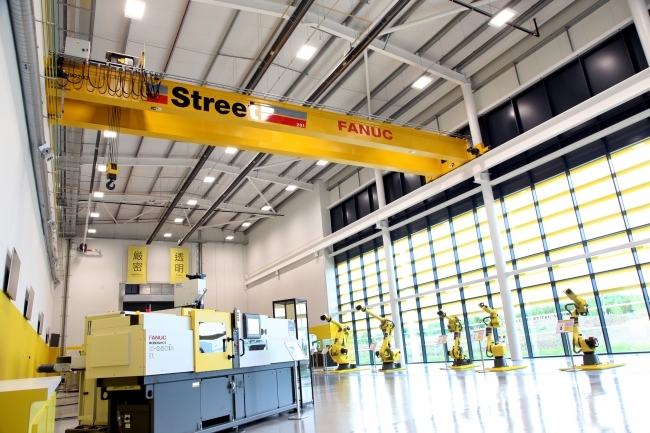 Street Crane has supplied and installed overhead cranes at Fanuc UK’s new 107,000 sq ft purpose-built headquarters at Ansty Park in Coventry. Fanuc builds around 6,000 robots, 125,000 servomotors, 84,000 servo amplifiers, and 25,000 CNC controllers every month to serve the wave of demand within manufacturing for fourth industrial revolution technology. The new £19M state-of-the-art facility has brought the company’s robotics, machine tools and factory automation activities under one roof. It includes design, manufacturing and training facilities together with offices and a large showroom area. Building contractor Bowmer & Kirkland appointed Street to design the overhead cranes prior to construction starting. In order to maximise the available “envelope” within the roof space and facilitate installation, a two-stage process was agreed, which saw Street install the cranes before the roof was fitted, including full weather protection. The cranes were then fully commissioned during the second visit and handed over once the facility had been finished. 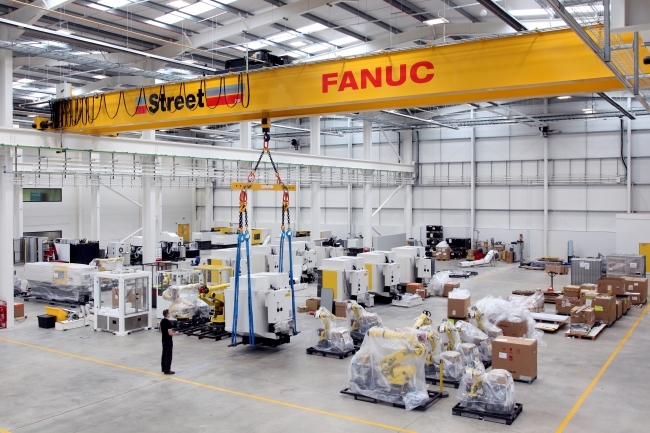 Three double-girder cranes have been supplied as part of the facility’s 48,000 sq ft workshop, which retrofits, assembles and tests industrial robots, CNC machines, and turnkey automation systems. Radio-remote controlled, the cranes have a lifting capacity of 20 tonnes and are used for the loading and unloading of vehicles, moving machines around the workshop area and assisting with assembling and disassembling of equipment. Chris Lindley-Smith, sales director at Street Crane added: “As we were involved during the early stages of this project, we provided all the up-front consultation work to the building and steelwork contractors, including budgets, crane design dimensions, and structural loading information. This detail was then factored into the facility’s construction programme and resulted in the cranes being installed more quickly, efficiently and cost effectively.